Years and years working for Bossman, it’s been an honor! We discussed all these things we’d love to do for our city, our town, our beach, our community, our schools, our military, our customers and the Hodads employees. He had this idea, that after every summer we wanted to treat ALL his employees to something to show his appreciation for all their hard work and loyalty. He always said that his biggest asset is his employees. 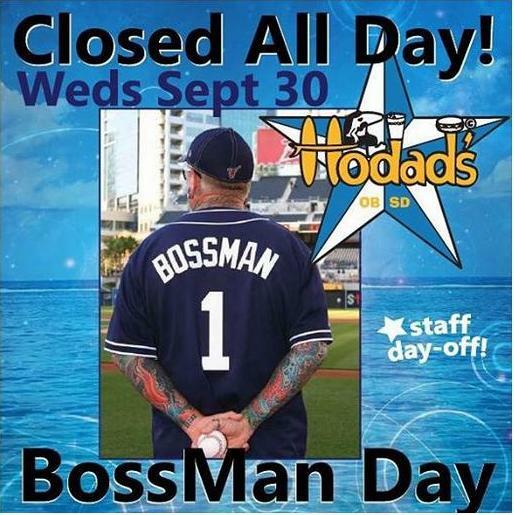 All Hodads will be closed, calling it Bossman Day! We are all going to the Padres game and Shane, Bossman’s son, will be throwing out the first pitch in honor and love for his papa!